SL 7000 Series has the functionality and style to meet the communication needs of customers in the hospitality, services, security and airport industries. 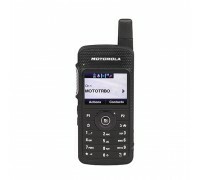 Weighing as little as your average smartphone, its slim design and forward-thinking features, such as Intelligent Audio, integrated Bluetooth and covert mode, enhance your level of professionalism and discretion so you can provide superior customer service and faster response times. The SL 7000 Series empowers your people with clearer voice, real-time data and discreet communications so they can collaborate like never before.